I'm thankful to a reader who made me aware of an incident of SRAM chainrings failing. Check out these bizarre picture. Have you seen something like this? SRAM Red couldn't have gotten any redder than this.. 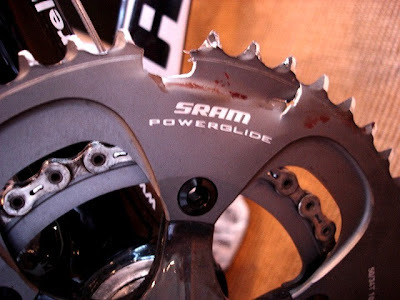 Note the rider's blood on the chainrings, from his fingers as he tried to bend if off the chainstay. "Its a compact chain set 50/34 with 175mm cranks and actually this happened when i was shifting down from the bigger ring to the smaller one, and no damage was incurred during transit as i had been using a flight case for air transportation, and the fact that I'd done 260 miles on the bike in the previous week in hillier areas." What may grip you, and me also, is the fact that AL 7075 is a pretty high strength material used even for structural parts in airplane fittings and other important applications. But I'm sure to get the Red's overall weight down to sub 2000 grams, they must have CNC machined out some decent material off the AL7075-T6 chainrings. Before we pin this as the rider's problem or a manufacturing problem, I feel there definitely is more to the story than we know at this point, to make a valid conclusion. But here's the word though, and I'm not sure if this is true or not - The bigger riders in Team Astana this year were using normal Dura Ace chainrings with their other SRAM Red gruppo. Matched to the new crankset is an equally revolutionary pair of chainrings. Optimized exclusively for Red components, they're stiffer than anything ever before, for greater efficiency as well an incredible power transfer ability. As a heads up though, for you riders out there using Red's chain rings, keep an eye out for this problem. Late to this post, but its interesting - I had an almost identical experience (minus the blood fortunately). They are pretty light, and I'm on the more powerful side, so the combination of that and user error meant I didn't bother chasing a warranty, and just switched to Force!